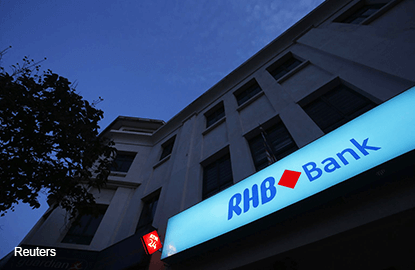 KUALA LUMPUR (Aug 3): RHB Bank Bhd's group business banking (GBB) unit is set on contributing 20% from 16.9% now to the bank's total loans by 2020 which seems attainable due to its strong growth in GBB loans, said CIMB IB Bhd. CIMB analyst Winson Ng said the GBB unit performed well with strong loan growth of 12% year-on-year (y-o-y) in March 2016 while gross impaired loan ratio has been trending downwards from 4% in December 2013 to 2.5% in March 2016. "It gained market share in the small and medium enterprise (SME) segment from 6.2% in Dec 2013 (sixth-largest player) to 8.9% in March 16 (fourth-largest). "The GBB unit had a high low-cost deposit ratio of 51% and risk-adjusted return on capital ratio of 16% (18% for SME portfolio)," he said in a note today. Ng said this after attending RHB's GBB unit's briefing for 30 analysts and fund managers where it highlighted strategies and targets by 2020 for the unit that services SMEs and commercial banking customers. CIMB made two adjustments to its numbers on RHB including a 1% point reduction in the bank's loan growth for the financial year ending Dec 31, 2016 (FY16) to 6.2%. "This that leads to 5% to 7% cuts in our FY16 to FY18 earnings per share forecasts and a drop in our dividend discount model-based target price from RM6.20 to RM6," he said. CIMB maintained an "add" call on its top pick RHB for the benefits from its 'Ignite 17' transformation programme, attractive valuation of FY17, price to earnings ratio of 9.6 times and price to book value of 0.8 times. The downside risks to its target price are a spike up in gross impaired loans and prolonged softness in loan growth, Ng said. At 11.11am, RHB dipped seven sen or 1.42% to RM4.87 with 421,200 shares done, valuing it at RM19.8 billion.